We in Southern California are so spoiled. We’ve got amazing weather and a diverse geography with which to enjoy it; where else can you spend a couple of hours surfing in the morning and be snow skiing by lunchtime? We’ve got Vin Scully, two Stanley Cups in three years, and two solid college football teams 13 miles apart. We eat great food and drink killer wine, all sourced from farms, ranches, and vineyards within driving distance. And, of course, we have a broad and thriving cultural scene: high brow and low brow, mainstream and obscure, stupid expensive and free — you can find it all here, at a high quality. Nowhere is that clearer than in the quality, quantity, and variety of classical music offerings by all of the orchestral, operatic, chamber music, choral, et al, presentations in the LA/OC region. The best example of this is at Walt Disney Concert Hall, care of the area’s classical music behemoth, the Los Angeles Philharmonic. Other cities have not been so lucky: the Atlanta Symphony finally saw an end to their second painful lockout in the past three years; memories linger of financial & labor strife at the Minnesota Orchestra, Detroit Symphony, and other fine organizations; the Metropolitan Opera, San Francisco Symphony, New York Philharmonic, and Chicago Symphony barely avoided protracted battles of their own. Meanwhile, the local band regularly displays its virtuosity in a diverse repertoire, including tons of music by living composers; it takes chances and stretches boundaries with atypical concert ideas; it does so in a concert hall that is the envy of most cities. This 2014-15 season is only nine weeks old, and you’ve gotta chuckle when the biggest programming outlier so far is the weekend that featured a Mozart piano concerto and a Beethoven symphony. I’m hard-pressed to think of any other orchestra where that’d be true. So far this season, I’ve had the opportunity to attend six of the eight subscription programs presented by the LA Phil, three conducted by Gustavo Dudamel and three by Esa-Pekka Salonen, and they were all somewhere between solid and magnificent in programming, interpretation, and musicality. In fact, each concert could probably be considered an extraordinary evening in most other concert halls, yet they have become commonplace here. Spoiled, lucky, blessed — whatever you want to call classical music fans in SoCal, we’re guilty as charged. With all that in mind, and for a change of pace during this early part of the season, I’ve decided to take a longer view and publish my thoughts on these six concerts in retrospect, all at once, rather than publish individual reviews. I thought it’d give me a different perspective on the state of the orchestra overall, along with chance to see if the initial impressions I jotted down after each concert were actually the things that stuck in my head a few weeks later. My general impressions are thus: the LA Phil is in spectacular shape. Each section sounds as good as I can remember on a week-in, week-out basis, and collectively play with power, precision, and flexibility. Mr. Dudamel, now in his sixth season as Music Director, demonstrates more physical restraint on the podium and less wildness in his interpretations than he did when he first took the job, but still manages to maintain a sense of spontaneity when he conducts. Moreover, the rhythmic snap the orchestra had during Mr. Salonen’s tenure which was absent a few years ago has returned. 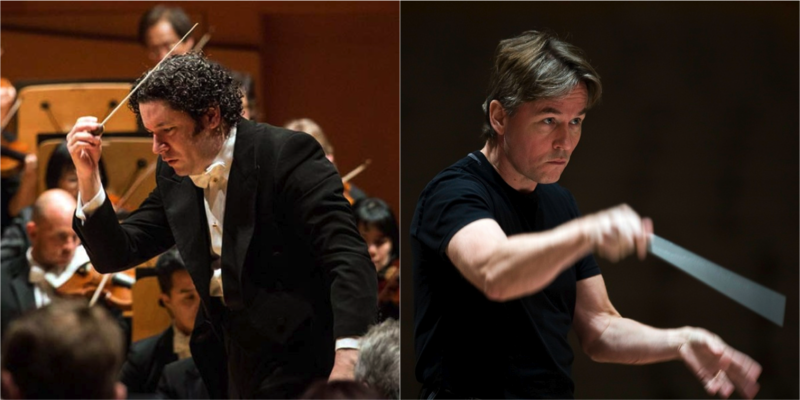 What’s really fun is to hear the orchestra in close succession under their two most familiar conductors: the core of the sound remains more consistent than it used to , but under Mr. Dudamel the strings play with more guts and warmth, while under Mr. Salonen the strings regain a certain sheen and transparency. I’m kind of surprised that this turned out to be the concert I found to be the least compelling. I had been really looking forward to it, and it was excellent in many respects. 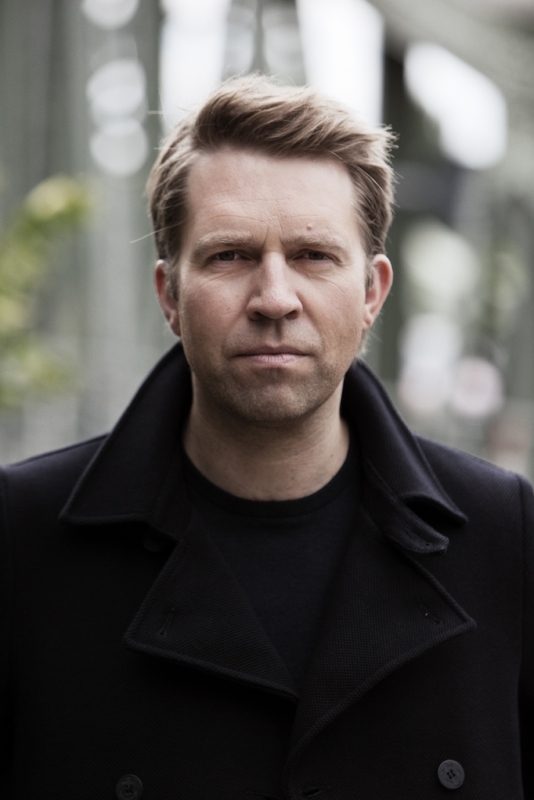 First of all, Leif Ove Andsnes wrapped up his three-year survey of Beethoven piano concertos with a probing account of the “Emperor;” in fact, it was probably the most personal and individual interpretation of any of the concertos he has performed over the past three seasons. There was also the excellent work by the Los Angeles Master Chorale, especially during John Adams’s Harmonium, an early indication of the composer’s adeptness at writing choruses. But none of this could overcome the amusing irrelevance of Beethoven’s Choral Fantasy. It’s a brief work that inexplicably requires sizeable forces (orchestra, chorus, six vocal soloists, and a piano soloist), which is the most likely reason it is rarely performed — and which is probably for the best, because it sounds like a messy hodge-podge of ideas left over from Beethoven’s other works. Despite wonderful performances by everyone involved, I don’t need to make a point of seeing it performed ever again. 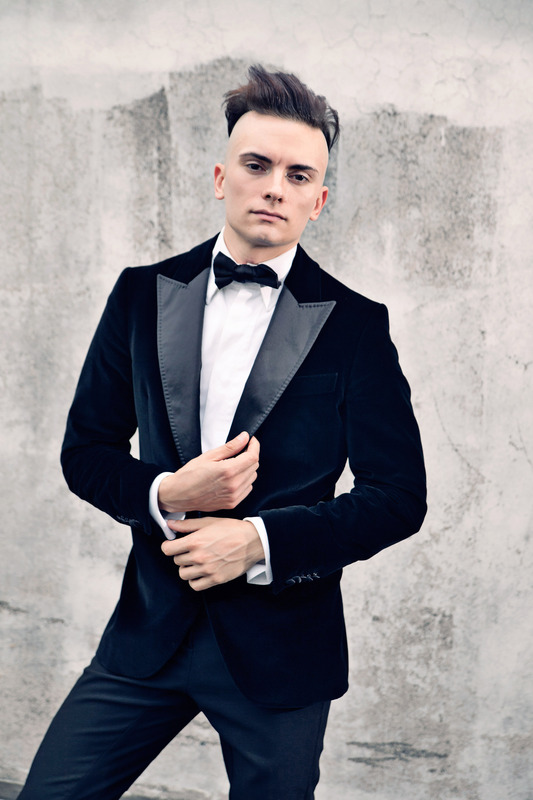 Cameron Carpenter is well past being an organ-playing prodigy, and I think it’s even unfair to call him a virtuoso. No, I think Mr. Carpenter can best be described as an organ savant, matching incredible technical prowess with improvisatory skill and a modern, bad-boy sensibility. His approach to this arcane concert instrument is unique, to the point where he often travels with his own custom-designed digital organ. That he has become a regular visitor to Disney Hall is a welcome development. This particular concert with the orchestra was made even better by the simple placement of the organ console so that the soloist’s back was to the audience, allowing those of us in attendance to see his adroit fingers and feet at work (unlike last April’s concerts where he faced the audience and the console blocked most people’s view). Thank goodness for that. Barber’s artful Toccata Festiva gave Mr. Carpenter many chances to show off, particularly in a pedal cadenza that featured some dazzling heel-toe work. He could be seen adjusting stops on the fly during the joyous 3rd Symphony of Saint-Saëns, changing the setting he used from the previous night to match the differences in balance and timbre coming from the orchestra; combined with Mr. Dudamel’s thoughtful approach and the orchestra’s lights-out playing, the entire symphony — and especially the finale — was as noble as one could ever expect from a work that usually comes across as mere bombast. Unfortunately, the other two works on the program weren’t quite as memorable. Mr. Carpenter’s transcription for solo organ of Scriabin’s Sonata No. 4 was nuanced, but still somehow managed to lose my interest before it was finished. The same could be said for Stephen Hartke’s Symphony No. 4, a Los Angeles Philharmonic commission receiving its world premiere during this particular weekend’s performances. Mr. Hartke’s heavily orchestrated (including an organ part played by the LA Phil’s Joanne Pearce Martin) new work was intricately detailed, so much so that I often couldn’t see the forest through the trees. By the time a soprano soloist begins singing an interpretation of Federico Garcia Lorca’s poem, “Sleepwalking Ballad,” it seemed like a different work, yet still a rather impenetrable one. The whole thing could certainly benefit from another hearing or two, but it didn’t quite grab me enough to make it a priority. I would, however, make a point of hearing Heidi Stober sing again; she has an appealingly bright tone in her voice that she used with gusto. 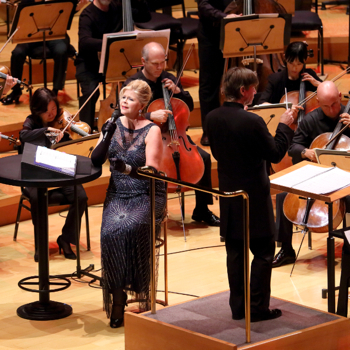 One more noteworthy element to this concert: it was the first-ever concert in the LA Phil’s new “Inside the Music” series, with Brian Lauritzen (prominent public radio personality and friend of All is Yar) the ever-capable host. The approach includes an expanded “Upbeat Live” pre-performance lecture before the concert and Q&A with conductor and soloist after the concert, both from the stage inside WDCH’s main auditorium. It also includes some behind-the-scenes videos being emailed to ticket-holders before the concert. For this particular concert, much of the Upbeat Live time was spent with Mr. Carpenter playing two solo organ works by Bach. It will be interesting to see if future pre-concert lectures in this series will include more multimedia elements. Among Beethoven’s most well-known symphonies (read: the odd-numbered ones), the 3rd Symphony is the one I’m least likely to select on my iPod. I enjoy it well enough, it’s just that I gravitate more to the other ones. Perhaps if I could bottle up the experience I had with the Eroica on this night, I’d feel differently about it. Mr. Salonen’s take on this warhorse was bold, athletic, and vibrant. It was truly heroic without ever sounding pompous, with the horns in the 3rd movement trio sounding particularly glorious. 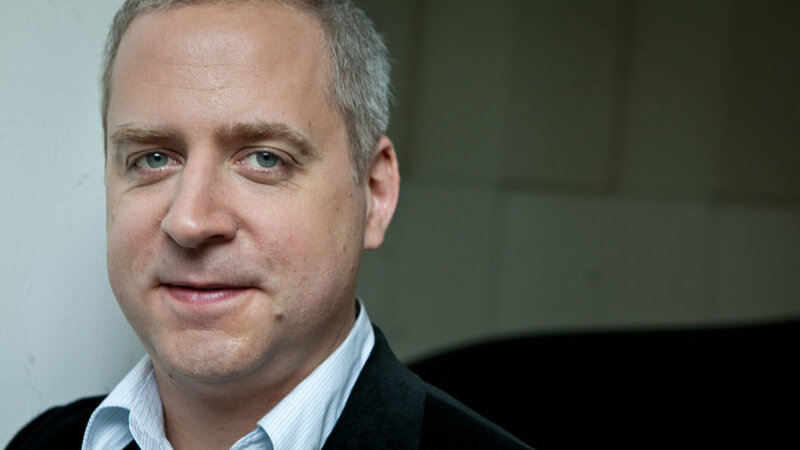 Before that, Jeremy Denk gave his typically intelligent and insightful account of Mozart, in this case the Piano Concerto No. 20, adding his own angular yet still wholly appropriate cadenzas. It was a wonderful night of music. Absolutely no complaints. I’d be thrilled to hear this concert again and again. 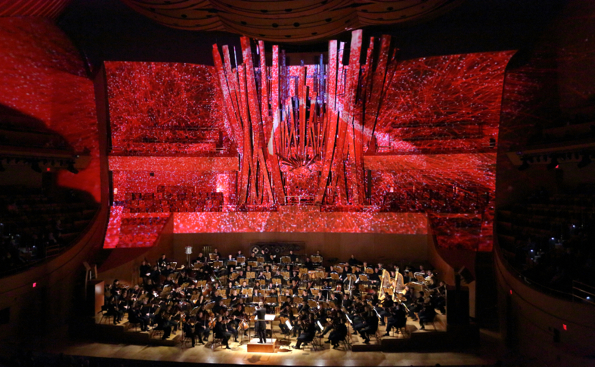 Mr. Salonen originally planned to roll out Berlioz’s Romeo and Juliet in a collaboration with video artist Refik Andol the week after he conducted the familiar strains of Mozart and Beethoven, the first concert of the Los Angeles Philharmonic’s new “in/SIGHT” series; however, technical difficulties required that project to be shelved. Taking its place was a very different program of concert hall rarities by a group of foreign composers who all relocated to America, finding new audiences and garnering great acclaim. That turned the concert from a mild curiosity to a must-see event. It did not disappoint. Opening the evening was Bernard Herrmann’s Suite for Strings from Psycho. Mr. Salonen and the LA Phil recorded this (and many other excerpts from Herrmann film scores) in 1996, but remarkably, they hadn’t actually performed it until these concerts. Thank goodness they finally did. Hearing the whole suite — not just the iconic shower scene — played in Disney Hall’s crystalline acoustics was a rare treat and reinforced my belief that this bracing yet beautiful music should be a concert hall staple. My next hope is that someone convinces them to play the Overture to North by Northwest sometime soon; it’d make a perfect encore piece, by the way. Mezzo-soprano Susan Graham then joined the fun, cabaret style. She convincingly slinked her way through a collection of Kurt Weill songs from the comfort of a bar stool and tall cocktail table, with martini glass filled with a clear liquid (“just water,” we were later told) to complete the effect. Most of the music was from Weill’s Broadway period, with “Das Lied Von Der Harten Nuss” being the lone example of the composer’s earlier, thornier Weimar output. Ms. Graham did her torch singer best, eschewing all but the slightest hint of operatic voice. Some saucy work by Burt Hara on clarinet and Wade Culbreth on drum kit added to the mood. Mr. Salonen’s Foreign Bodies, “the most American” of his works by his own estimation, was next up. Its pulsing rhythms and complex harmonies were dispatched with seeming ease by the orchestra, and it set the stage perfectly for the wonderful craziness that came after intermission. Amériques was the first work written by Edgard Varèse after emigrating to Manhattan, and is the French composer’s wild and wooly sonic reaction to the cacophony that surrounded him in his new home, as well as a representation of his break with old traditions. It may be almost 100 years old, but Amériques still sounds more outlandish and inventive than pretty much anything that has come since. It requires unreasonably immense forces, including 14 percussionists, 21 brass players, among many others, and their collective output genuinely rivalled that of an arena rock concert. Salonen and the orchestra gave it as committed a performance as you could expect, meeting every burst of sound, jolt of sforzando, and flare of color that Varèse asked of them. Jazzy bits, impressionistic moments, foreshadowing of minimalistic rhythms, outright noise — it was all in there somewhere. The effect was stupefying, and yet it worked. I couldn’t help but walk out wondering what the hell I just experienced, but knowing for certain that it was really cool. Mr. Anadol’s videography certainly added to the feeling of wonder. Rather than projecting onto a typical screen, he utilized the entire back wall including the seating behind the stage and the organ, and the upper side walls and terrace-level seating as his backdrop (because of this, those seating areas were left empty, thereby limiting the audience to a smallish but enthusiastic crowd). The images were generally abstract, often precisely following the curves and edges of the walls and overhangs of the Frank Gehry-designed space and seeming to bring the balconies move and come to life. It even created a sense of motion similar to Disneyland’s “Star Tours” ride or even the old “Circle-Vision 360” experience. This was truly an innovative and unique experience, and I’m looking forward to what he eventually does with Romeo and Juliet if/when it gets rescheduled. If someone can tell me of another mainstream orchestral organization courageous and/or crazy enough to program a night like this, please enlighten me. This was about as stereotypical a program as Mr. Salonen could have put together: Janácek’s Sinfonietta is the kind of orchestral showpiece into which the conductor loves to sink his teeth; Kaija Saariaho is a long-time friend and collaborator, and with Mr. Salonen being the leading proponent of her music, a U.S. premiere of one of her works is de rigueur; Sibelius is, well, Sibelius, and the suite of four Lemminkäinen tone poems was the first work he recorded with the LA Phil after becoming Music Director. Oh my, did it sound VERY good. The Lemminkäinen Suite in particular was marvelous. 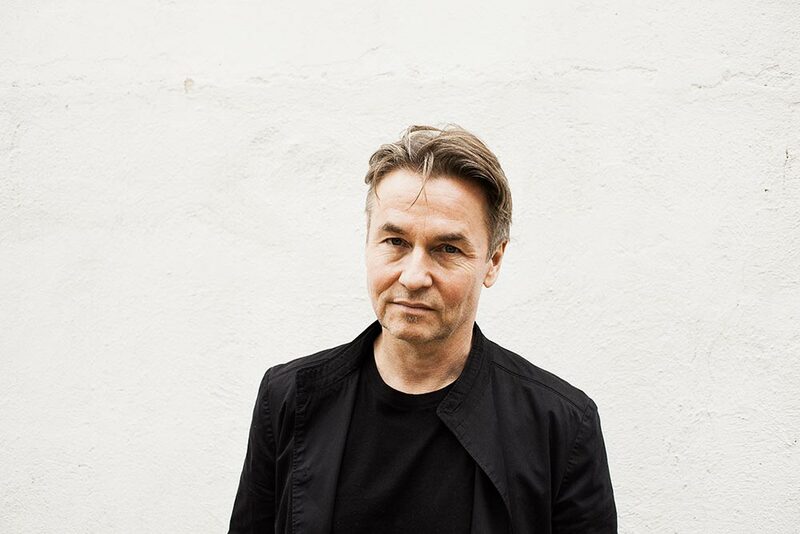 It is technically four individual works, and while they are often performed separately, Mr. Salonen treats the four them as movements in a symphony. On this afternoon, that structure seemed ideal, even profound, with Mr. Salonen imbuing an almost Brucknerian robustness without losing any of Sibelius’s brightness or agility. Compared to their twenty-year old recording, conductor and orchestra played it with more verve, range of timbres, and earthiness. Principal Cello Robert deMaine played his various solos with warmth, Carolyn Hove played the big English Horn solo in Swan of Tuonela with soulful melancholy, the woodwind section as a whole sounded notably lovely, and the strings shimmered throughout. Mr. Salonen’s take on the Janácek Sinfonietta, the concert’s opening work, was less about probing musical depths than it was a welcome opportunity to show off and revel in the sound the LA Phil can create, especially the orchestra’s excellent brass; they were, as Janácek requires, augmented by a battery of extra players, among whom included LA Phil alumni trumpeters Donald Green and Rob Roy McGregor, as well as Bryce Andrus, Principal Horn of the Atlanta Symphony. Mr. Salonen and the orchestra gave it a glorious rendition. The centerpiece of the program was Maan varjot (Earth’s Shadows), Ms. Saariaho’s new composition for organ and orchestra. Oliver Latry was the capable soloist on this day and for the world premiere by Kent Nagano and the Orchestre Symphonique de Montréal just a few months previous. It is a well-crafted work, deftly weaving solo instrument and orchestra in and out of each other, from an opening rumble in the organ pedals and percussion to a mix of eerie, sultry, and swirling sounds. Yup, this was my favorite program of the season, and it wasn’t even close. 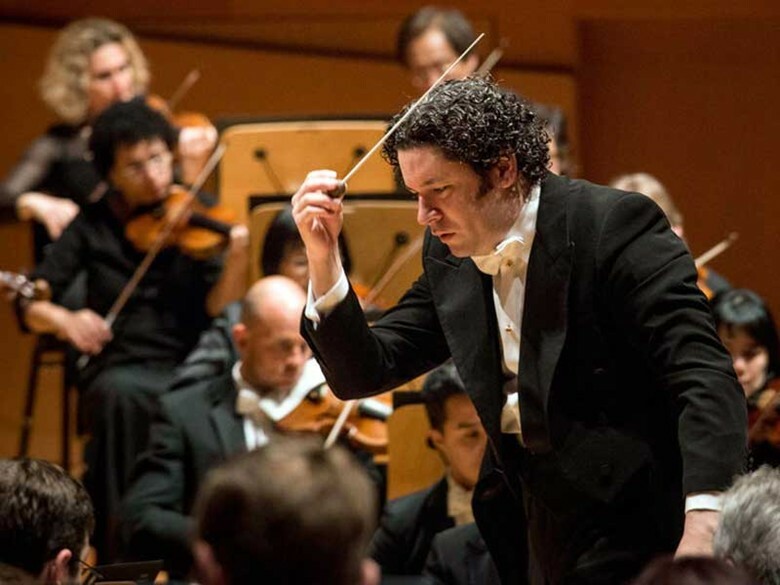 As has become their habit — a very good habit, I should say — for these season-opening weekends, Mr. Dudamel and the LA Phil matched a well-known showpiece with a new composition receiving its world or US premiere. Both works performed were top-notch, and featured some amazing solo work by guests as well as key members of the orchestra. Dale Clevenger played as guest third horn, for goodness sakes. How could you not love this concert? In fact, I loved it so much the first time around, I went again two days later. Upon reflection, man made by David Lang is my favorite new work of the season so far, and you should know that I’ve generally grown weary of Mr. Lang’s characteristically sparse, halting style; the world premiere of his national anthems by the Los Angeles Master Chorale earlier this year was particularly tedious. With man made, he begins similarly but then expands his rhythmic and melodic vocabulary in interesting ways. 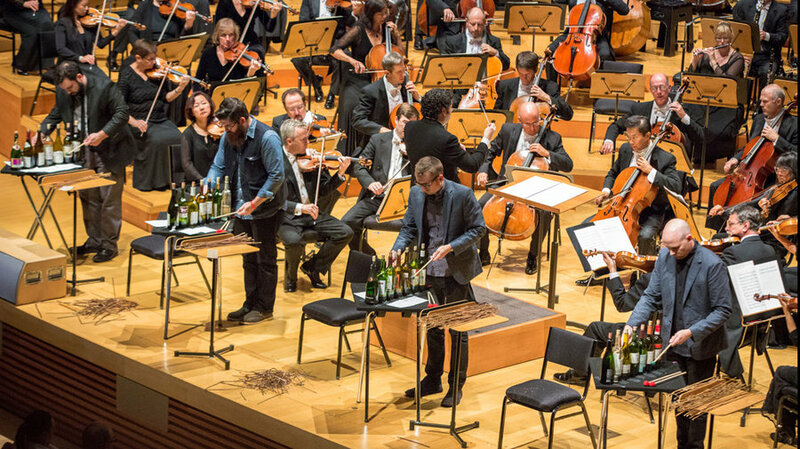 The four members of Sō Percussion were perfect advocates for the work, employing changing sets of instruments — snapping twigs, clanging on wine bottles, banging on drums and trash cans, and finally playing tuned mallet instruments and a drum kit — with remarkable precision. Mr. Dudamel and the LA Phil supported admirably, with the percussion section acting as veritable translators between the rest of the orchestra and the soloists. Collectively, the musicians brought to life Mr. Lang’s various sonic landscapes, from mysterious, to ominous, and finally to ethereal. Secondly, and more importantly, Mahler’s 5th Symphony is one of my favorite works, and Mr. Dudamel and the LA Phil gave it a thoroughly brilliant reading. The orchestra’s Music Director has conducted it regularly and has recorded it with his other orchestra, the Simon Bolivar Symphony; however, this was the first time he led the LA Phil in it. His interpretation was broad in scope and rich in texture. He often took slower tempos (the 4th movement was a spacious 12 minutes by my unofficial timing), but the entire symphony flowed perfectly, never dragging or sounding ponderous. When changing tempos or emphasizing specific details, he did so without distorting the shape of any individual phrase or movement, focusing instead on the long line and saving the biggest crescendos and fortissimos for the fifth movement finale. Principal Trumpet Thomas Hooten set the mood perfectly with his opening solo, and shined brightly through the rest of his many exposed lines with a big, lyrical sound. 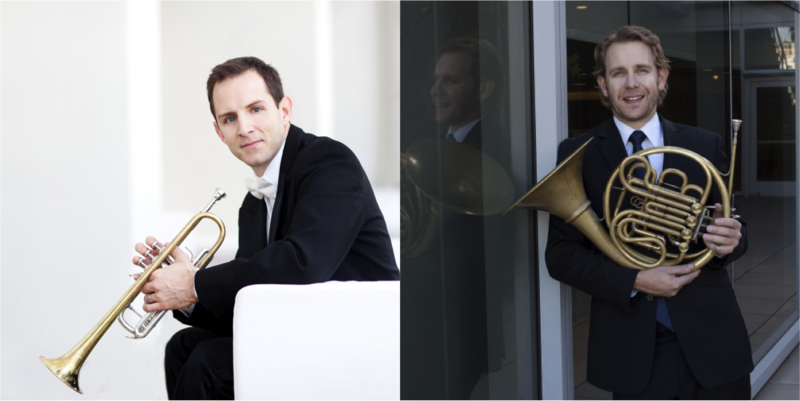 Principal Horn Andrew Bain was thoroughly commanding in his third movement obligato, radiant from the outset and growing ever more haunting as the movement progressed. It was the latest example of just how high a level at which these two are playing currently, with no less than Mr. Clevenger praising their artistry and musicality later Friday evening. In fact, the entire orchestra seemed to give Mr. Dudamel everything he asked for and then some. He offered the brass a long leash to strut their stuff, and they took advantage of it without ever running roughshod over the rest of the orchestra in the process. The strings were taut yet warm, playing with a heart-wrenching beauty in the famous Adagietto. The woodwinds were stellar, often exhibiting a darkness in their timbre that added a chewy texture to the whole sound. I’ve seen the Mahler 5th Symphony performed many times before, including twice at Disney Hall. I also have a few recordings of the work, with preferred versions by Zubin Mehta conducting the LA Phil and Klaus Tennstedt leading the London Symphony. Mr. Dudamel’s interpretation in these two concerts may not be the definitive one, but they have surpassed all my previous experiences to become my favorite. Tags: Andrew Bain, Beethoven, Bernard Herrmann, Cameron Carpenter, David Lang (composer), Edgard Varese, Esa-Pekka Salonen, Gustavo Dudamel, Heidi Stober, Janacek, Jeremy Denk, John Adams (composer), Kaija Saariaho, Kurt Weill, Leif Ove Ansdnes, Mahler, Mozart, Oliver Latry, Refik Anadol, Saint-Saens, Samuel Barber, Scriabin, Sibelius, So Percussion, Stephen Hartke, Susan Graham, Thomas Hooten. Bookmark the permalink.